A reliable and flexible telephone system was essential in meeting their guests’ expectations and ensuring their continued business. 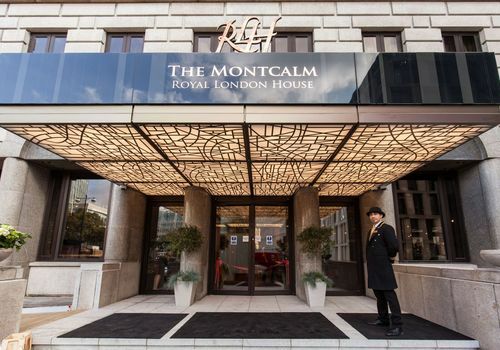 Montcalm urgently needed a cost-effective telephone system for their new hotel, Royal London House. Guest rooms needed to have specific brand-standard analogue phones. It had to provide cordless phones for service staff, leveraging off existing Wi-Fi network (to avoid the huge cost of installing a separate DECT wireless system throughout the building). Integrate with the hotel’s PMS to automatically bill guests for their calls, handle wake up calls, configure the guest extensions with guest name, clear any voicemails at check out, etc. Premium-brand desk phones were desired for staff to ensure great user experience, and present an on-brand impression to guests. The Montcalm Royal London House is a five-star hotel in Finsbury Square, City of London. It is part of the Montcalm Luxury Hotels, a group of luxury five-star hotels across central London. They thrive in the hospitality industry by providing excellent services to their guests. Having experience with several different telephone systems in our other hotels across the Group we decided to use 3CX System in our new property and this turned out to be an excellent choice. We required specific phones for staff and guests, Wi-Fi phones for service staff and integration into the hotel’s PMS room booking & recharge system to bill guests for their calls. 3CX is a very open and flexible platform, we used ATA gateways to connect normal analogue handsets which we use as our brand standard in guest rooms. GMA helped in choosing different hardware vendors for telephone handsets based on operational requirements. We had a wider choice of options, than we have seen with other PBX systems which typically tie you to their brand of handsets. GMA provided everything needed and made it a cost-effective solution. Backup phone lines and multiple levels of hardware and software redundancy. GMA were responsible for project managing the implementation. This involved liaising with several third parties via regular meetings and conference calls to keep all parties concerned on top of their actions. Montcalm are delighted with the new system. The Wi-Fi phones provided a very cost-effective means of ensuring service staff are always contactable to meet guest expectations. Phones in guest rooms and on staff desks are consistent with the Montcalm brand requirements. Multiple levels of redundancy ensure the system will recover from any failure. Project was delivered on budget and schedule. One of the features we like best is the 3CXPhone soft phone app which supports iOS, Android and Windows smart phones. This saves a lot of recurring charges with staff communications as they are connected to their extension wherever they are, and this helps in providing a great experience for our guests. Built in web meeting (video conference) facility for 50 users without extra licensing cost is a deal breaker for our event rooms and allows us to provide additional service to our guests without paying additional service fees. We love the 3CXPhone Windows application for our sales team who work remotely from different sites and still get their calls and missed call notifications from their valuable clients. Since our 3CX system is installed on Windows Server and managed via a web browser – the management interface is familiar to all our staff, so it is easy to maintain and configure without too much technical expertise. Built in fail-over protection makes 3CX the best choice for our hotel which needs communications 24x7x365. We know that in the unlikely event that the primary system or phone lines fail, the system will automatically recover from the failure and return to service. With 3CX there are no hidden costs! With a transparent pricing model and no per extension licensing fees the costs of running our PBX has reduced significantly.